The sound of barbarians doing as much pillaging and burning as they could? War hymns sung while drinking an elephant's weight in ale? A shitload of Viking horns blowing in unison? The answer turned out to be "awesome." Subsequently, my beard grew two feet. In the tradition of continuing their pillaging, Amon Amarth have released Surtur's Rising. Surtur is referring to the giant of a guy on the cd cover. Supposedly, Surtur is quite the powerful guy, and can go berserker on anything period. My knowledge of Viking religion is pretty weak outside of Odin, Valhalla, and Heimdall, but this Surtur guy sounds like he could give Odin a run for his money. Makes sense that Amon Amarth picked him to title their new album, as it's just as equally powerful. Surtur Risisng is classic-sounding Northern Europeon metal with the Viking story thrown in, and my first true proper introduction to the band. For having such a vicious vocal output, Amon Amarth can hold down a heavy melody quite well. I was expecting a Nordic version of Nile that was just technical death metal about Odin, but the awesome melodies these guys come up with are just amazing. The first track, War of the Gods, is a worthy of helicoptor banging, and there's the slower track Slaves of Fear. Slaves ended up as my favorite track, as it's slower tone brought out a real show of maturity with the band. Just because you can conquer lands doesn't mean you can't take a few and chill to something that sounds beautiful. 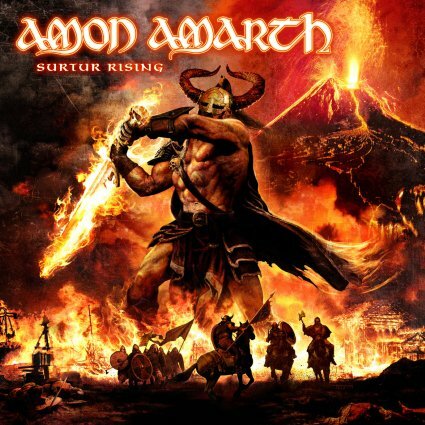 I've had flirtations with Amon Amarth in the past, but with Surtur being the first by the band that I've listened cover to cover, I can now say I'm a total idiot for not listening to them earlier. Supposedly, they have already a huge deal in the metal community, and here I've been, close to oblivious of their size or their presence. I have truly angered the Viking lords, and now I must repent. Oh well. Ale's on me boys! First time I listened to Amon Amart my beard grew down to my knees and I had an unstoppable urge to take everything from everyone! Can't wait to break out the beard braids and expand my collection of everything.